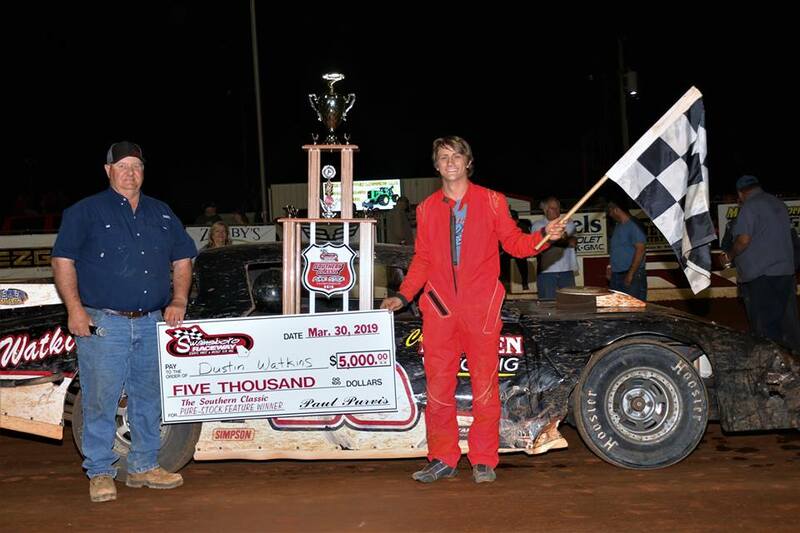 Southern Classic $5000 to Win at Swainsboro Raceway! 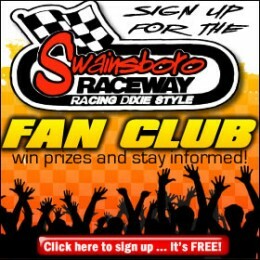 By admin Comments Off on Southern Classic $5000 to Win at Swainsboro Raceway! 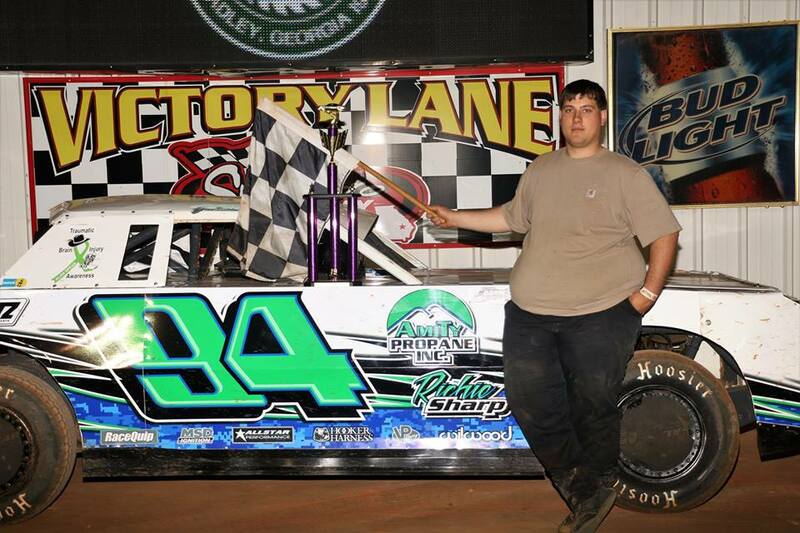 Twenty of the South’s finest drivers rolled into Swainsboro Raceway Friday night qualifying and heat races in the Daniels Chevrolet Pure Stock division Southern Classic event paying $5000 to win. Johnson County bad boy Jottie “The Body” Burgamy earned the top position. Burgamy led the field to 50 lap green with Jason “Flywheel” Floyd sitting outside. 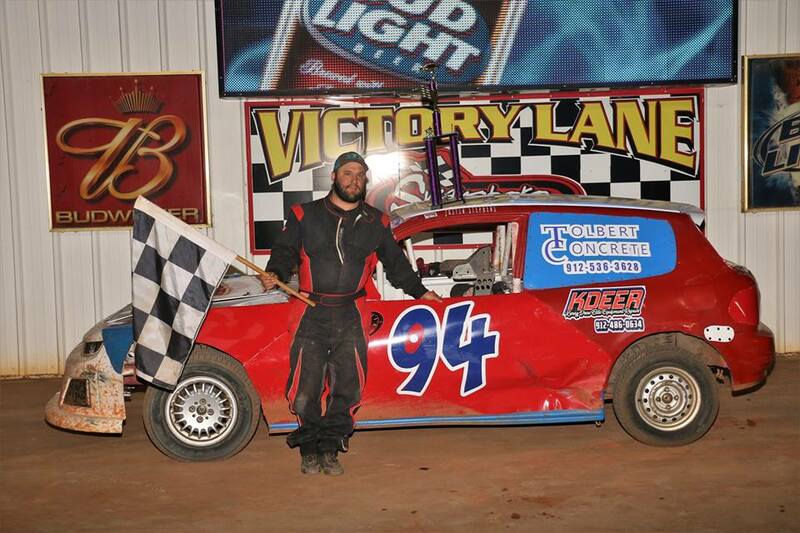 While six big time contenders started up front, three others fought bad luck Friday night starting in the rear of the field would be Dustin Watkins, Brent Herndon, and Kip Poole. In the twenty-car field, any one contender held a huge chance at picking up five grand within 50 laps. Floyd immediately took advantage pulling to the lead with Burgamy second and Clay Alexander claiming the third position. Top five stacked scrubbing metal. Within a couple laps, all eyes on Preacher Man Brother Kip Poole starting 17th after dropping a motor on Friday night already up to the eighth position choosing that outside groove. Roger McKenzie grabs hold of the action inside Brandon McDaniel for the fifth position and works on Alex Sturkie for fourth. Only five laps in, three cars battle three wide for third, Alexander falls back to fifth. Lap 20, McKenzie looks inside Sturkie for the third position but Sturkie slams the door. Lap 22, Alex Sturkie brings out the caution in two restarting at the rear. Floyd continues to lead with Burgamy second as laps wind down track surface begins to get slick and wear on tires. Lap 33, McKenzie moves in on Burgamy attempting for second. Ten to go, top five stacked Brandon McDaniel checks up off turn two moving in on a lapped car bringing out the caution. Unfortunately, after having one of the best runs of the night, Roger McKenzie night ended with heavy damage. 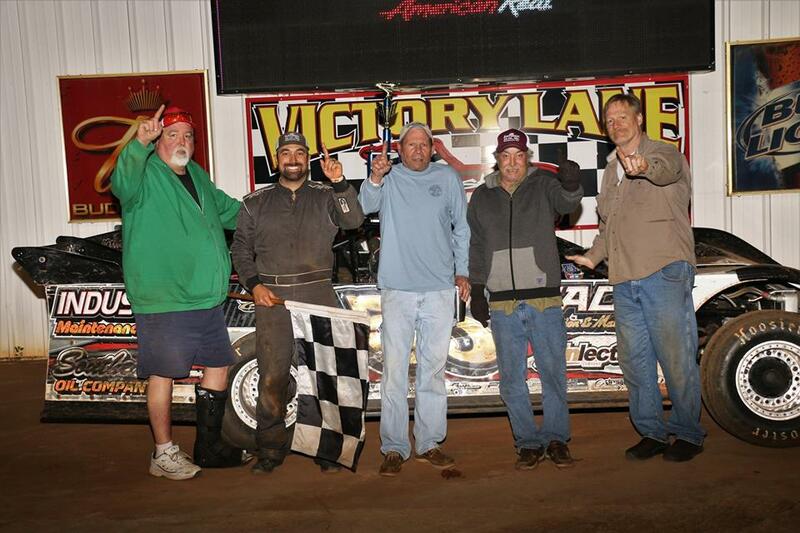 On the restart, with ten left Floyd led the way with Burgamy second, Dustin Watkins moved into the third position after pitting twice, changing two tires, and restarting on the rear in the first half on the race. Lap 42, Watkins takes over second from Burgamy. Lap 43, three wide for fourth with Alexander, Sturkie back in top five and Brent Herndon on the move after also starting rear of the pack. Five to go, combination of better tires and old school moves learned from generations passed down, Watkins makes the move in turn three. Visible for several laps, Floyd was fighting handling issues a little bit harder in the turns. Dustin Watkins took advantage, with a nudge, Watkins stuck the 56 machine underneath Floyd to make the pass off four and seal the deal going in turn one. Dustin Watkins then checked out by a few car lengths as the battle for second caught fire. 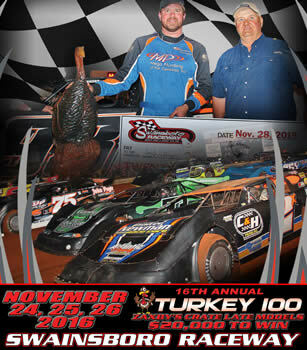 Dustin Watkins earned the Daniels Chevrolet $5000 Southern Classic Win. Coming to the checkered off turn four three wide, inches separating each car, photo finish Alex Sturkie also came from the rear grab second place, Jason Floyd third, Jottie Burgamy fourth, and Brent Herndon rounded out the top five in one of the best competitive dirt track feature races ever. In the Southland Insurance 602 Sportsman division, Ricky McClain earned the heat race win and pole position over Matthew Davis. McClain wasted no time taking a hefty early lead but Blake Akridge jumped into the second position with Paul Smith third. Davis fell to the outside back to fourth. Three to go, battle for third Davis and Smith get together on the back stretch bringing out the caution. 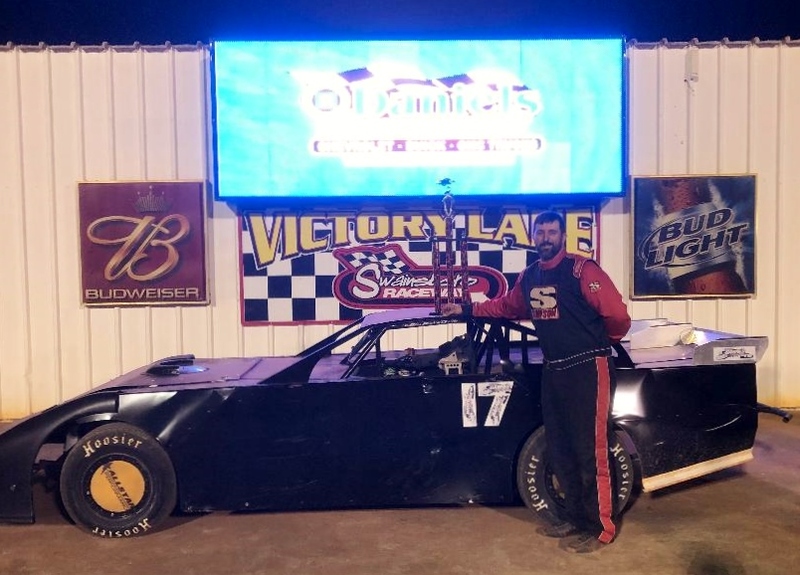 Ricky McClain takes nearly a two second win picking up his first victory of the year over Blake Akridge second, Paul Smith third, Morgan Sheffield fourth, and Matthew Davis fifth. Up next Jamie Whitaker led the Sunoco Super Street division to green with Bobby Oglesby sitting outside. Whitaker took a fast lead with Oglesby second and Brent Herndon moving into third. Lap two, George Williamson slips tagging the outside wall in the fourth position. Halfway, Herndon fighting handling issues allows Michael Slater to get inside for the third position off turn four. Jamie Whitaker checks out and never looks back picking up his second win of the season, Bobby Oglesby finished strong in second, Brent Herndon third, George Williamson fourth, and Rak Donaldson fifth. 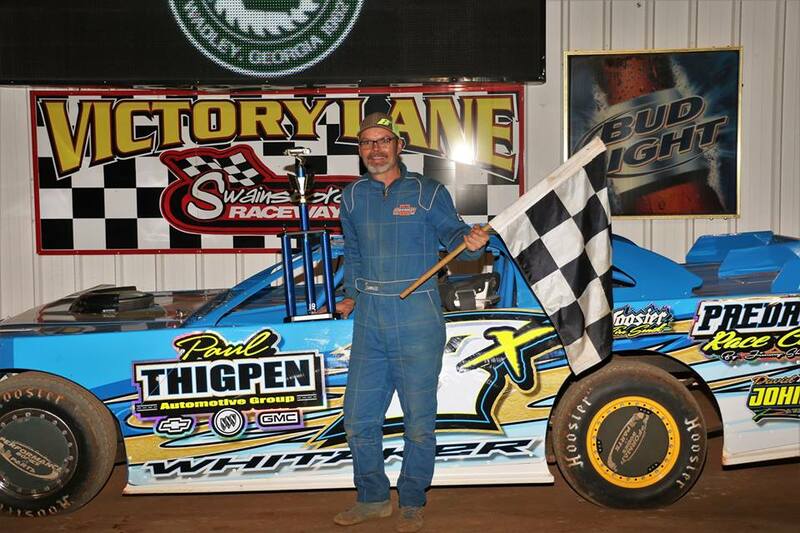 Twenty-four cars signed up for the Roger Wheeler Construction Road Warrior division, Graham Stevenson, Jimmy Haynes, and Jaime Foskey each picked up heat race wins. Stevenson took the lead, Foskey pulled into second with Haynes third. Off turn two, Haynes night ended short as he’s turned and flips sending him to the pits for the night but fortunately, he was safe. Mother to newborn 4 week old boy, Kylie Bayles, wasted no time jumping back into the driver seat took over the third position. Lap 5, Jordan Johnson moved into fourth. Halfway, Foskey took a look to the inside of Stevenson off two but Stevenson held on to the lead. Lap 8, after a caution Foskey tried the inside again off four but Stevenson pinched him off in one. Graham Stevenson drove hard to Victory Lane picking up his first win of the season, Jaime Foskey second, John Lariscey third, Jordan Johnson fourth, and Justin Williams started tenth to move in the top five making several passes on the outside. Picking up the heat race wins in the Scare House of the South 440 division Rafael Dejesus and Rod Morris led the field to green. Rod Morris quickly pulled to the lead but after two cautions the field went single file. On the single file restart, Dejesus held the advantage due to winning the first heat race. Starting in the third position, AJ Joyner takes a hard lick off turn two sending him for multiple flips on the back stretch. Joyner was unharmed but unfortunately his night ended early. On the restart, Dejesus fell back allowing Justin Stephens to move up front with Morris second, and Trey Spradley moving all the way to third from twelfth. Lap 3, Scott Helton took over the fourth position and quickly on lap 4, moved inside Spradley for third. Three to go, Spradley takes hard turn to pits. Justin Stephens takes the checkered, Rod Morris closely in second, Scott Helton third, Rafael Dejesus fourth, and Richie Green finishes out fifth.